Particulars that shall be transcribed according to the specified commercial transaction law. Institutional name of the seller K-FILE Inc. X-FIRE Sales Div. When using Paypal, we charge a 3% from the total of the item price, shipping cost, and damage compensation insurance fee as handling charge . 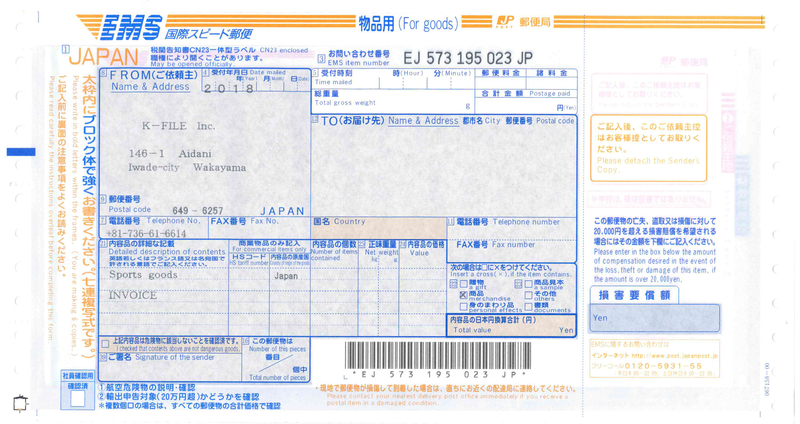 In case of damages to products or missing contents, EMS will compensate for damages up to 2 million yen maximum. For product value of less than 20,000 yen it is free of charge, however you will need to pay extra fees to insure products with value totaling more than 20,000 yen. Additional fee is 50 yen extra per 20,000 yen. It is deemed to have agreed with us and the agreement will become effective in case of your actual use being confirmed by us. Contents of the package is described as "Sports Goods". We try to provide good service for every user. But it may be not enough service for you because we're not native English speaker. Please understand. Also consider TD, we try to reply your order ASAP. If you do not read that,we can not reply any questions after your purchasing. Private information of our customers ( name, email address, address,phone number, order record ) shall not be transfered to outsiders except for legitimate reason. We have many goods for Airsoft.Those contents are for international customer. If you're Japanese domestic customer,we can't ship to you. In that case, please access our Japanese shopping cart. If you want to exchange product because of order mistakenly placed, we can't support you, so please confirm well before ordering. We carry PDI & other products all around the world, please mail to us if you have any questions. But we are not sure of each local law, so please confirm by yourself what regulations do you have. Especially if your customs can allow your package to be imported. We cannot be held responsible. We use mainly EMS, if you want other methods such as Fedex or UPS, it's OK but we require your account. For the below address, we can't use EMS directly. So we need to use normal postal. When you get the package, please open asap and confirm whether it's good or not because our guarantee period is 7days after parcel is delivered. If you feel something is wrong with your products, please mail to us with photo. We will confirm and replace it if it is defective. But this decision is not up to you and we do not accept any claims. All springs may give a fatal damage to your gun. When using high power springs it may cause damage to your gun as the parts are not meant to take the stress of springs with high tension. We cannot be held responsible if any damages occur when using them. Please enter your shipping details, name, and phone number here when placing your order. Please note that we will not cross reference those with your paypal account. Our invoice price is the final price. We can't write a fake price. Also we do not pay for the customs fee, please pay them yourself. We will exchange products that are defective. However scratches and deformation etc that results from installation are not included and we will not exchange them. PDI use DURALUMIN & ANNODIZED so it's possible for pinhole to occur on the surface. Please do understand that this does not have any effect on performance and we do not treat it as a defective product and we do not accept any exchange request. Sizes are PDI original so it is different from the original. If you claim that it is a different size, it's not problem for us. For example, someone claimed that the L96 reciever was not same dimension as the original one. So it resulted in faulty operation. In this case, problem that a too high powered spring was used. PDI don't recommend any high powered springs as 1J over. If using that, there may be some problems. But someone said PDI's dimension was not same as Original, so it's defective. Now we don't accept any claim like this.